Srinagar, India (AP) — Indian troops killed three rebels on the outskirts of disputed Kashmir’s main city on Sunday, ending a nearly 18-hour-long gunbattle, officials said. Indian paramilitary spokesman Sanjay Sharma said the three militants were killed on the outskirts of Srinagar. Two counterinsurgency police officials and a soldier were wounded, he said. Sharma said Indian troops had surrounded a neighborhood on Saturday on a tip that militants were hiding there. As the troops began conducting searches, militants opened gunfire, triggering intense fighting in which three combatants were killed, he said. Police identified one of the slain militants as a teenage boy who had joined rebel ranks in August. The fighting sparked anti-India protests and clashes as residents tried to march to the site of the battle. Government forces fired warning shots, shotgun pellets and tear gas at the stone-throwing protesters. At least five people were injured in the clashes, police and residents said. 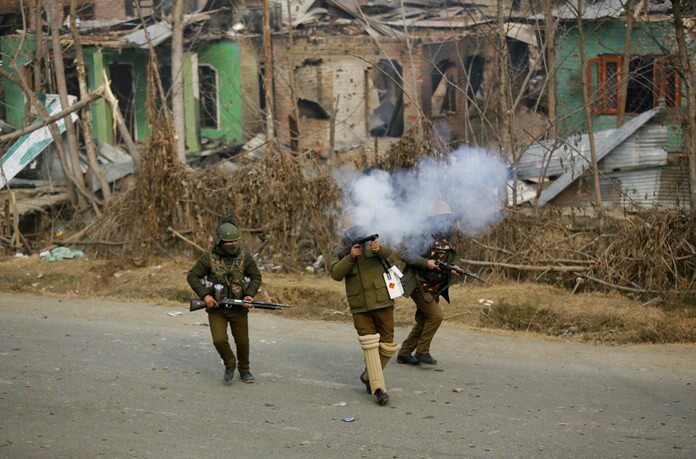 Residents said government forces blasted at least five houses with explosives during the fighting, a common tactic employed by Indian troops during counterinsurgency operations in Kashmir. Authorities also suspended internet services on cellphones in Srinagar, also a common tactic during gunbattles and anti-India protests to discourage further protests and dissemination of protest videos by Kashmiris. Most Kashmiris support rebel demands that the territory be united either under Pakistani rule or as an independent country, while also participating in civilian street protests against Indian control.